Our community has 3,116 members, 38 online now. We’ve published 9,780 stories, shared 8,327 images, made 10,348 blog posts and written 121,546 forum posts. Though the ink has faded with time, the memory will always remain sharp and clear. It was Halloween weekend, just a little over two months before Katy passed away and we were spending it in one of Katy's favorite places. Asheville, North Carolina, about 100 miles from our home. My mother was in town from Florida, and my eldest sister had taken a flight in just a few days prior, from California. After we had dinner that Halloween night, the four of us were making our way along the crowded sidewalk. My mom and sister followed slowly behind, while I pushed Katy's wheelchair. Between the window shopping and watching the revelers, we were enjoying our mini vacation. When we got close to our hotel, we came upon a tattoo parlor, which despite being closed, was well lit. As Katy and I looked through the window, I jokingly said, "Hey Katy, do you want to get a tattoo? If you get one, I will too." Not in a million years did I think she would say yes; she wouldn't even let them put small tattooed dots on the radiation field to ease the discomfort she underwent each day during the many weeks she endured radiation, so I just knew she would give me an 'are you crazy?' look and tell me, "No way!" Normally, such things are forbidden for a cancer patient, so I thought the doctor would tell me no. 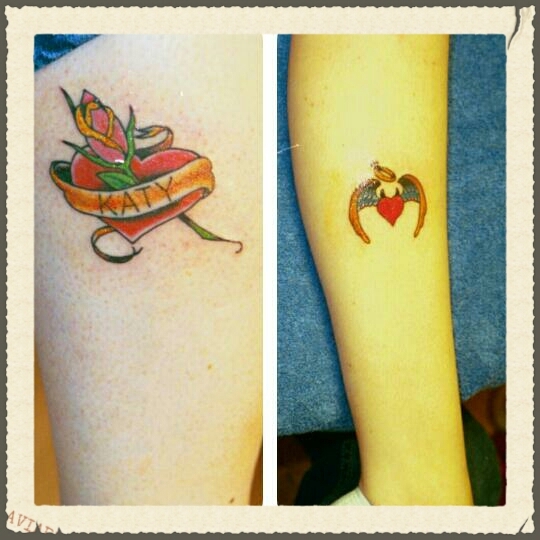 Much to my surprise, instead of no, the doctor told me, "Sure, as long as the place is sanitary, I'm okay with letting Katy get a tattoo." (A few weeks later, I found out the doctor gave her approval because Katy had lost so much during her illness and she just wanted Katy to do something that would give her some happiness and would put a smile on her face for the time she had left.) When I told Katy what the doctor said, her eyes lit up with excitement. If she didn't have to stand for an extended period of time or walk long distances, Katy didn't want or need her wheelchair, so the four of us walked the block and a half from the hotel to the tattoo parlor. Once there, we both took our time deciding what we would have done. The tattoo I chose needed no changes, they just added Katy's name in the banner. Katy chose a heart with wings, and we had them add two small horns and a tilted halo, this was her way of letting me know how much she truly enjoyed another of the nicknames I'd been calling her for years. My "heavenly devil" earned the moniker because she got such a kick out of 'pranking' me whenever her playfully wicked sense of humor gave her the opportunity, which was as often as possible. The place wasn't very big; It had two or three small rooms for the tattoo artists, a reception/waiting area in front, which was about triple the size of the tattoo rooms combined, and an area in back with a bathroom and a table. While Katy and I were in one of the tattoo rooms, my mom and sister sat on a sofa in the front and by the sound of the bell jingling each time someone opened the entrance door, I knew the place was busy on that Monday afternoon. Of course, Katy wanted me to have mine done first, and I obliged her. She sat watching closely as the artist went through the whole process, asking him questions from time to time. Then it was Katy's turn. She had me sit on the table so she could rest her head in my lap, then she gripped my hand firmly in both of hers. She was nervous but determined to regain some control over what happened to her body. She was composed for a while, but just after the guy finished the first side of the tattoos outline her resolve broke. She squeezed my hand tightly and said in a VERY loud voice, "What the HELL was I thinking?" We heard laughter coming from the front, and the tattooist asked if he should stop. Katy didn't hesitate before telling him, "No, don't stop; I just need a few minutes before you continue if you don't mind." Which, of course, he didn't. What is humorous to me about this is, though Katy was 19 years old and had spent the prior 19 months going through so much, this was only the second time in her entire life she said a 'bad' word in my presence and then she apologized to me afterward for having said it. What makes this so memorable for me and special to me is what happened after the tattoos were finished. Katy had gotten off the table and stood waiting for me to join her. When I did, she wrapped me in a big hug, smiled wide and said, "Guess what, I got a tattoo!" We then walked, hand in hand, to the front area where she proceeded to do and say the same thing to both my mother and sister. Katy was on cloud 9. As we walked back to the hotel parking lot to get the car, Katy had a huge smile on her face. Every time someone we passed looked at her, she stuck her chest out with pride and said, "I just got a tattoo!" Every few minutes she would squeeze my hand and repeat those same words to me. Her joy was infectious, and she brought smiles to many faces that day. With that tattoo, Katy had reclaimed some of the independence she'd lost over the previous 19 months and, in her own way, laughed in the face of cancer that would kill her just 65 days later. Copyright © Copyright © 2014 - 2019 Darlene T.
All rights reserved. No part of the publications submitted by Darlene T. may be reproduced or transmitted in any form or by any means, electronic or mechanical, including printing, photocopying, recording or by any information storage and retrieval system without express written permission from the author or copyright holder.